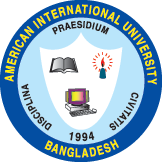 - Exchange of Publications, Reports and Other Academic Information During their stay in Bangladesh Dr. Akmal & Prof. Maria attended several meetings with the top officials of AIUB. They attended separate meetings with the AIUB Trustee Board members, Dr. Carmen Z. Lamagna, the Vice Chancellor, Dr. Anwar Hossain, the Pro-Vice Chancellor, Dr. T. Hossain, Vice President for Academic Affairs, Dr. Charles Villanueva, Dean of Faculty of Business, Mr. Ehsanul Huda Chowdhury, Director, MBA program, Dr. Matiur Rahman, Director, BBA program, Mr. M. R. Sarker, Director, AQAC and the Departmental Heads of the Business Faculty. They also attended a seminar, arranged for the students and faculty members of AIUB, on 13th October 2009, at AIUB auditorium. In that seminar Prof. Maria Malama made a presentation on Gavle University and Dr. Akmal talked about the facilities they are going to offer to the students of AIUB.